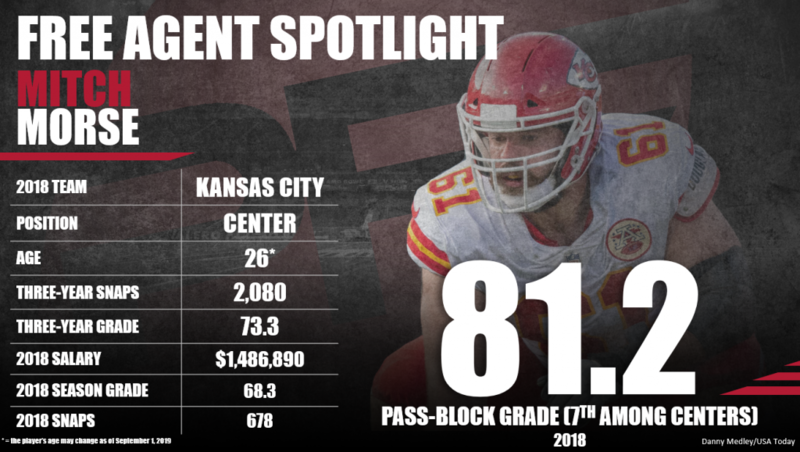 Kansas City Chiefs’ Mitch Morse is a high-floor pass blocker but lacks high-end run-blocking ability. He’s earned 70.0-plus pass-blocking grades all four years of his career but has failed to finish above 70.0 in run-blocking grade in any of the four years. Pro Football Focus will be running through 50-plus pending/soon-to-be free agents between January 7, 2019 and March 8, 2019 to offer a detailed analysis of the top players bound for new contracts and (possibly) new teams in 2019. We want to house all of the important grades, advanced stats and key analysis for each player, so you know exactly what your team is getting in free agency. To review all of our free agent profiles in one place, please visit this page. Morse’s lackluster run blocking will push teams away, but any team in search of a pass-protecting center with years of high-floor production should jump at the opportunity to sign him. Subscribe to Pro Football Focus’ ELITE subscription to research Mitch Morse’s grades, advanced stats, snaps and more in Premium Stats 2.0.